This is one of the recent videos I prepared and styled for Allrecipes.com ~ Hedgehog Cookies. Aren’t they adorable? 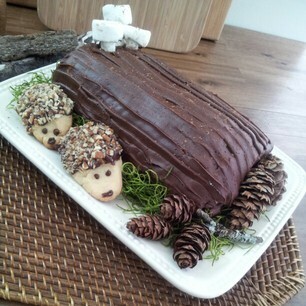 Because displaying the cookies on their own would not be as much fun, I decorated a purchased cake log with frosting and a selection of pine cones and moss. To make it come to life, I cut up a few marshmallows to create mushrooms growing out of the log. For the finishing touch, a sprinkle of unsweetened cocoa over the top. And then of course the Hedgehog Cookies! Dipped in melted chocolate, covered with chopped nuts, and piped with chocolate to create the sweet faces. Who can resist? 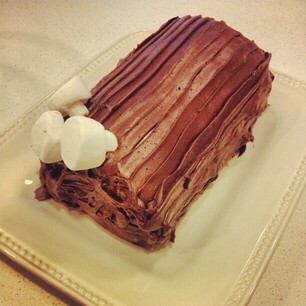 In the process of creating the log…. And here is the video showing you step by step the creation of these cookies. Enjoy! Be sure to come back to see more videos! The narrator got really excited when it came to the part about pecans 😉 These are super cute.